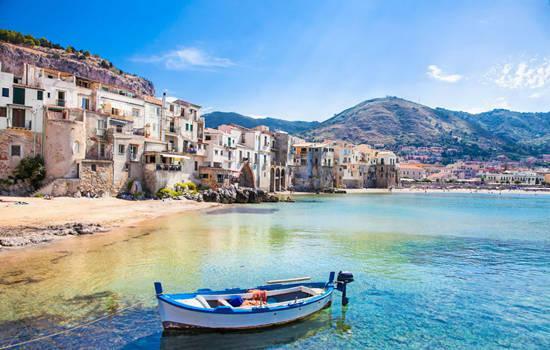 A Sicily sailing itinerary takes you to the stunningly beautiful Egadi Islands west of Palermo, and to the picturesque harbors of the Sicilian coast. On longer cruises, you can sail to Pantelleria Island 52 nautical miles off North Africa, to Tunisia, and to Malta (see Sicily maps). Both the islands and the coastal cruising grounds are enchanting. They blend the bustle of chic ports such as Palermo with the quiet ambience of small fishing villages on remote and scenic islands. Swimming, snorkeling, and sunbathing on pristine beaches is delightful. Sightseeing tours of palaces and cathedrals, fascinating archaeological sites, and historic island and coastal towns is intriguing and educational. Browsing in eclectic boutiques where fashion is of the first order, and dining in fine restaurants serving exquisitely prepared local cuisine is the essence of luxury. These are among the many pleasures you will enjoy while sailing in Sicilian waters. Palermo to San Vito Lo Capo - 34 nm. 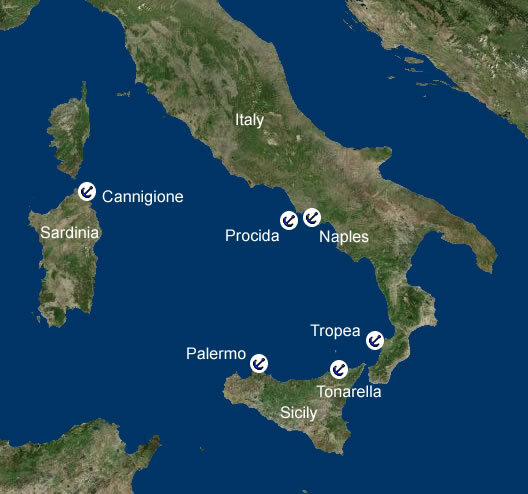 Your Sicily sailing itinerary typically began the previous day, Saturday afternoon at 3:00 P.M., when you arrived at the base to check in, provision the boat (if you hadn't elected to have us do it for you), and receive your pre-cruise chart briefing. Now that you've had a restful night aboard, it's time to head out onto the shimmering Tyrrhenian Sea to your first port of call, the beautiful and fascinating harbor of San Vito Lo Capo. It's not a long passage west, allowing plenty of time to fully explore ashore. A special treat is a visit to the Museum of the Sea, where you can learn about the history of the port and view artifacts recovered from the seafloor. There are excellent restaurants, lively bars, and lovely streets closed to vehicular traffic, making them welcoming and inviting for pedestrians. Mooring: Moorings are available. You can anchor outside the harbor of San Vito Lo Capo. Things to do: The main attraction of this harbor is its pristine white-sand beach popular for swimming and snorkeling in some of the clearest water of the Mediterranean Sea. A stroll in the public square around the shops and restaurants near the town center at the church of Chiesa Madre is a good way to enjoy some time ashore, as is a visit to the Museum of the Sea, where you'll find all sorts of interesting artifacts taken from the seafloor in and around the harbor. The nearby Zingaro Nature Reserve has walking trails, more beaches, and is a wonderful location for bird watching. San Vito Lo Capo is famous for its International Couscous Festival held every September, when the town comes alive with tourists eager to enjoy the culinary delights from famous chefs all over Europe. Facilities: Dockage, fuel, and water are available at San Vito Lo Capo Marina. San Vito Lo Capo to Favignana - 25 nm. Your second day of sailing takes you farther west past the end of the Sicilian coast. As you raise the Egadi Islands off the bow, to port you will see the broad expanse of the Mediterranean Sea. Tunisia lies about 100 nautical miles due south, with the wonderful Pantelleria Island halfway in between. Your first port of call in the islands is Favignana, the largest in the Egadi group. The beautiful beaches, fine restaurants, and resort hotels make the island a popular tourist destination. Mooring: No moorings are available. There are many good anchorages, including at Porto Favignana. The south side of the islands has good anchorages in the many bays with attractive beaches for swimming and snorkeling. Anchor between Punta Longa and Cala Rotonda. On the northwest side of the island is Cala Rossa with its intriguing grottos. Things to do: The main town is Favignana Città, though it is hardly a city by any stretch of the imagination. Picturesque with its two piazzas, it's a wonderful place to spend time exploring on foot. The two most popular beaches are Cala Azzurra and Lido Burrone on the south side of the island. The grottos at Cala Rossa are well worth exploring, including the Grotta dei Sospiri (Grotto of Sighs), so named because in winter the waves flowing in and out of the cave make it sound like someone is sighing. Scuba diving is good all around the island, especially at Cala Rotonda, Cala Grande, and Punta Ferro. Facilities: Fuel and water are available at Porto Favignana. Favignana to Marettimo - 14 nm. Just a short sail to the northwest is another jewel of the Egadi, an island known for its remoteness and its rugged rocky coast lined with impressive cliffs and intriguing caves. Much of the area is a marine park where the snorkeling and scuba diving is excellent. Freshwater sources are abundant on the island, fostering rich and varied flora; more than 500 species of rare and unique plants grow on the steep slopes of the interior. A stroll along some of the paths is a pleasant way to spend an afternoon. Mooring: No moorings are available. There are numerous anchorages available, depending on the wind direction. A quite scenic anchorage is on the south side of the island between Punta Lebeccio and Secca del Cretazzo. Things to do: Since the west side of the island is a restricted marine preserve, taking a guided boat tour to explore the caves, beaches, and cliffs is worthwhile because of the unparalleled beauty of the area. Abundant marine life is everywhere. Hiking to the ruins of the Spanish castle and strolling through the villages is a good way to experience this remote island to the fullest. Marettimo to Levanzo - 12 nm. To the northeast of Marettimo is the last and smallest main island of the Egadi group, Levanzo. Although there is a small village on the island, it has remained largely undeveloped and left in its natural state. The beaches are beautiful and the snorkeling is fantastic. Of particular interest is a walk to see the prehistoric paintings in an impressive cave, a reminder of just how long humankind has called the Mediterranean home. Mooring: No moorings are available. There is a good overnight anchorage in Cala Dogana off the island's only small village. Things to do: Snorkeling and swimming are superb between Punta dei Sorci and Capo Grosso. The village has several good restaurants and bars. The seafood is marvelous, as is the couscous. Not to be missed on a visit to the island is Grotta del Genovese (Cave of the Genoese). It rises 98 feet and its walls are covered in Neolithic paintings of human and animal forms dating back to the last of the Stone Age, about 10,000 B.C. It is truly an amazing sight to behold, harking back to the days when civilization as we know it today didn't exist in even the smallest way. Levanzo to Ustica - 62 nm. After cruising in the Egadi Islands, your Sicily sailing itinerary takes you on a rewarding open-water passage northeast to Ustica. Like Pantelleria Island, it's sometimes called the Black Pearl because of its basaltic volcanic rocks and beautiful black-sand beaches. From seaward the island really does seem to look black, though vegetation thriving in the fertile soil tends to offset the effect. The island's waters are designated as a marine preserve. The sea life is abundant. This is one of the premiere scuba diving sites in the Mediterranean Sea. In the typical northwesterly breeze, you'll be on a fast beam reach all the way, enjoying Mediterranean sailing at its very best. Mooring: No moorings are available. Anchor off the pier outside the island's only harbor at the town of Ustica. Things to do: The main town, Ustica, perches above the harbor and surrounding bay. It can be reached via a single road or stairs built into the slopes. As you enter the hamlet, you can't help but notice that the exteriors of the modest homes are painted in beautiful murals depicting the island's landscape as well as portraits of loved ones and other artistic renderings. A striking feature of the skyline is the stone Tower of St. Mary, which houses the island's Archaeological Museum and its collection of Neolithic artifacts and other finds from the archaeological dig at Capo Falconiera. Nearby are the ruins of a Bourbon fortress. Myriad caves penetrate the coast, many of which can be explored on foot, by dinghy, on a guided tour with a local fisherman. A guided tour of the marine park is highly recommended. On the east side of the island are the Grotta Azzurra, Grotta Verde, and Grotta delle Barche, all of which are excellent for snorkeling. Scuba diving is also a major attraction at Ustica. Facilities: Fuel and water are available at Ustica Cala San Maria. Ustica to Palermo - 34 nm. The sailing is splendid on the passage back to Palermo. The typical northwest winds will be off your starboard quarter, ideal for a fast downwind sail. As you arrive back at the base by 5:00 P.M. to check out the boat, you'll bask in the sheer delights of the past week on the Tyrrhenian Sea. Mooring: No moorings or yacht anchorage is available in this busy port. The base in Palermo is a modern, full-service marina with all amenities. 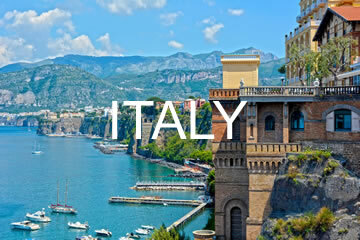 Things to do: The attractions of Palermo are extensive. You could literally spend three or four days exploring the city and not see everything. Not to be missed is the Cappella Palatina (Palatine Chapel), in the Palazzo del Normanni, where you can admire some of the most beautiful mosaics in the world. They focus on Biblical scenes. The church of Santa Maria dell'Ammiragilo is a Norman-style building constructed in 1142, just one of many historic edifices you'll find all over the city. The Regional Archaeology Museum provides a detailed look at the history of the city and the region and contains exhibits of prehistoric art. Kids and adults alike will marvel at the displays in the International Marionettes Museum. It includes roughly 3,500 puppets, marionettes, and hand puppets from all over the globe. The Sicilian Regional Gallery has a wide variety of paintings dating back to 1000 A.D. And, of course, Palermo is a lively city for nightlife with all kinds of nightclubs featuring live music and dancing. Some of the best restaurants in Italy are in Palermo and shouldn't be missed. Five-star hotels offer accommodations in complete luxury. Facilities: All facilities for yachts are available. All services for travelers are available, including car rentals, taxicabs, banking, and high-speed Internet access.